About six months ago Arteth predicted that I’d be overdoing things at work during September, so she arranged a holiday for us starting as soon as possible after The Deadlines. This was definitely a good idea: we’ve just had a very pleasant holiday staying at The Barn in Ashurst, on the edge of the New Forest. Cosy building, comfortable rooms, and very good food. They’ll cook up a different meal each day; I ended up eating and very much enjoying ingredients I wouldn’t normally choose. I can’t stand celery, but even their celery soup was marvelous. The Barn is just a few minutes walk from the edge of the forest. About an hour after arriving we’d already found pigs and ponies roaming the forest (we had the good luck of going during ‘pannage’, a period each year when pigs are released into the forest to eat acorns that could otherwise poison the local semi-wild ponies). The forest itself is beautiful, a mix of managed woodland, heathland, bogs, and unspoiled small towns. It is not wild (the area has been managed for at least a thousand years) but I’ve never seen so much vitality in the UK before: plants and animals seemed much more alive, more colourful, larger. I’m used to ants being indifferent to my presence as I walk past but the New Forest ants I met had the unnerving habit of stopping and turning to look back at me. I have never seen so many insects (or so many spiders - they aren’t short of food). I have also never seen such happy pigs. Most of them still end up ‘going to market’, but they seem to have a great time living as pigs should. The Barn offers a discount if you arrive via public transport, which isn’t a bad idea: Ashurst was surprisingly easy to reach using public transport from Manchester, and the area is pretty well covered by buses. You can walk all day then wait awhile and get the bus back. 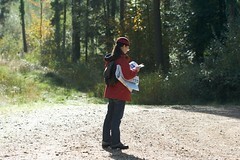 The experience of walking in the New Forest was a surprise too. The Lake District is good for vigorous walks and photographing wide views. The New Forest is good for slow, meandering (when possibly a little lost…) walks, full of beautiful small scenes and opportunities for macro photography. The light in October was magical - throughout the day sunlight was coming in at a low angle, filtered through morning and evening mists and golden leaves. I learned that it’s difficult to have a long, exploratory walk and also focus on macro photography - one involves moving, and one doesn’t. The area as a whole isn’t great from a vegetarian/vegan perspective as there are few veggie restaurants and healthfood shops but if you base yourself at a veggie-friendly place serving evening meals, such as the Barn, then it’s fine. I made the mistake of leaving my tripod at home, which resulted in a large collection of blurred macro shots, but the decent photos are now up on Flickr as usual.